The Name Has Changed But Not The Quality. In this Link Energy Solar Panels Review, we first mention that Solarland changed its name to Link Energy in 2017, but they actually started in 2003. They also have a high tech factory with a 600 MW volume. Link Energy is in fact a global brand, and now seen world wide. Found in 38 countries and with 15 offices also. They are now in fact a leading supplier of green tech products in Aussie. The Link Energy Pilot 60 270w is also a great panel we know too well. However, it has shown to be a very worthy, low cost panel for those that don't want to spend much. It’s a great choice because you can still get the result you want without breaking the bank. In this case we have put in hundreds of these panels and have not had any service issues at all. The panel also has a black frame which really does enhance its looks too. Such A Great Panel But For So Little. A panel still of good quality but at a lower cost than main stream big brands. This panel is not the best you can buy, but it is a step or two above entry level. This panel has a 35mm frame which is common and it is rigid also. In fact there are no bad words from installers, who say they are easy to put up. They make great panels, so buyers should not worry at all as the level of build is really high. Powerark back these panels and they do in fact have an office in all states. They have a great warranty in effect its 10 years on the panel, and 25 years on its output. But this is what most panels have in the industry these days. 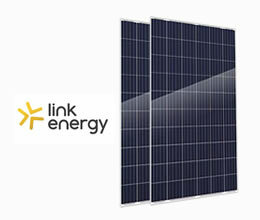 Link Energy Solar Panels have a 40mm Frame with also great wind load strength. The 270 watt Link Energy's have in fact a 16.49% output level. They also have a 4 busbar feature too that helps with shade and work great in low light. The panel glass is anti reactive and self cleaning which stops power loss due to dirt and salt build up.Our Rating: 4 Stars! Link Energy panels come with a super robust frame, they have a 40mm frame, and this makes them stronger and more durable! With the first Monocrystalline power plant being built 30 years ago, and continuing to run to date, this is why Link Energy are an advocate of monocrystalline solar technology.